The timing of surgical stabilization of a thoracolumbar spine fracture in a polytrauma situation is controversial. While delayed surgery was considered safe and the norm, over the last few years there is an increasing amount of literature available that supports early stabilization of the spine fracture with good neurological and non-neurological outcomes. Adequate “resuscitation” of the patient prior to surgical intervention is of paramount importance to reduce surgery associated “second hit”. The “spine damage control” approach is a safe and appropriate management strategy in a polytrauma situation. Minimally invasive stabilization follows the principles of “damage control orthopedics” and appears to be a good surgical option. The optimal surgical timing for stabilization of unstable thoracolumbar spine fractures in a polytraumatised patient is still debatable. Proponents of early surgical stabilization (within 48–72 hours of injury) have shown improved neurological and non-neurological outcomes, while advocates of delayed surgery cite the potential for hypotension, increased bleeding, “second hit” as some factors against early intervention. Here we present a case scenario of a polytrauma patient and discuss the various management options. We discuss literature relevant to timing of surgery (early versus delayed) with their outcomes, the need for patient resuscitation prior to surgery, surgical options and conclude with how the patient was managed. A 28-year-old male presented to emergency medicine 6 h after sustaining multiple injuries in a road traffic accident. He was conscious and alert (Glasgow Coma Scale-15/15), blood pressure was 90/64 mmHg, pulse rate was 132–140/min, and respiratory rate was 26/min. The oxygen saturation (SpO2) was 82% on room air which improved to 94% with 5 L O2. Chest examination revealed decreased air entry bilaterally, right more than left and tenderness of the 4th to the 9th ribs bilaterally. Abdominal examination revealed guarding with tenderness in the left hypochondrium. He had tenderness from D1 to D10 with a step at T5 and normal neurology. There was a Gustilo-Anderson Type 2 open left distal femur fracture with normal peripheral pulse in the injured limb. After initial resuscitation, he was investigated with radiographs and computed tomography (CT) spine, chest, and abdomen. The radiographs and CT scan images [Figure 1] and [Figure 2] showed a fracture dislocation of D4 over D5, with C7, D1, and D2 spinous process avulsion fractures. In addition, there were transverse process-pedicle junction fractures at D6 bilaterally and at D8 and D9 on the left side. There was a comminuted distal femur fracture with intra-articular extension. Focused assessment with sonography in trauma abdomen and pelvis scan (FAST) revealed a Grade 1 splenic laceration with minimal collection, and this was confirmed on CT scan. Blood tests revealed hemoglobin of 7.2 gm%, packed cell volume-21.3, arterial blood gas (ABG)-pH-7.24, HCO3-16, SpO2-88%, and carbon dioxide-28 (metabolic acidosis). The patient was admitted to the Intensive Care Unit and resuscitation continued. He had two units of packed red blood cells transfusion. Intercostal drains were inserted bilaterally and fresh blood drained. He was kept on mask O2-8 L/min, the blood pressure improved; however, tachycardia persisted (110/min), urine output improved to 25–30 cc/h. Repeat ABG showed marginal correction of metabolic acidosis (pH-7.29, HCO3-20). No intervention was required for the splenic laceration. Wait for the patient's condition to normalize completely and delayed surgery (probably several days later). Femur fracture-open reduction and internal fixation versus external fixation. The management strategy for isolated spine injuries is well defined; however, the “ideal” timing and modality of fracture fixation for unstable thoracolumbar spine fractures in polytrauma (Injury Severity Score ≥16) patients are debatable. The benefits of early fixation in isolated spine fractures include improved neurological recovery, early mobilization, improved pulmonary function, reduced pain, reduced deep vein thrombosis and pulmonary embolism, shorter Intensive Care Unit (ICU) and hospital stay, and decreased mortality. While these benefits are desirable, there is a concern that early surgery in a polytraumatized patient may cause the “second hit” with its attendant complications. Hence, definitive spine fixation is often delayed until after complete resuscitation of the patient (i.e., several days or weeks after the initial injury). The objective of the treatment in such situations is to balance the need for early operative spine fixation and limit the additional load of surgery (second hit). There is an increasing amount of literature reporting on the significant advantages and safety of early spine fixation (<72 h) as compared to delayed (>72 h) fixation in polytrauma.,,, A study by McLain and Benson reported that urgent (within 24 h) surgery was safe and appropriate in polytrauma with outcomes similar to those achieved in early (24–72 h) surgery. While early surgery is safe, the priority of surgical interventions and the time to perform them are dependent on the patient's physiological state. It is important to achieve optimal physiologic conditions before surgery by adequately resuscitating the patient. The “second hit” in an inadequately resuscitated patient may be associated with deleterious systemic inflammation and organ dysfunction. Metabolic acidosis on presentation is a prognostic indicator for the development of pulmonary complications, organ dysfunction, and death. Major trauma often requires profound resuscitative efforts to correct blood and volume losses and the ensuing metabolic acidosis reflected by changes in pH and base excess. Reich et al. and Vallier et al. in their studies on “early appropriate care” in polytrauma patients determined that it was safe to operate early on patients who were adequately resuscitated (defined as having either a lactate <4.0 mmol/L, pH ≥7.25 or base excess ≥−5.5 mmol/L) before surgery., Surgical intervention for life-threatening organ injuries takes precedence over skeletal stabilization. “Damage control orthopedics” is a well-established principle of provisional stabilization of long bone or pelvic fractures in patients with multiple injuries until more definitive surgery can be performed once all organ-related problems have been resolved. Along the same principles, Stahel et al. described the “spine damage-control” (SDC) approach, which is a middle path between “early total care” and delayed definitive spine fixation after full resuscitation. SDC is defined as a staged procedure of immediate posterior fracture reduction and instrumentation within 24 h (“Day-1-surgery”), followed by scheduled 360° completion fusion during a physiologically advantageous time window if required. In their study of 112 patients, they compared the outcomes between 42 patients who had early (within 24 h) and 70 patients who had delayed surgery. They reported that patients who underwent early surgery had shorted operative time, hospitalization duration, ICU stay, ventilatory support, and fewer medical complications. It appears to be a safe and efficient treatment strategy for severely injured patients with associated unstable thoracic or lumbar fractures. Spinal fractures may be stabilized using conventional open surgery or minimally invasive surgery techniques (MIS). MIS compared to open surgery has the advantages of shorter surgery duration, lesser blood loss, and minimal soft-tissue injury which limits the “second hit,” and hence, adheres to the principles of driver-controlled operation. An initial MIS posterior stabilization may be performed to allow mobilization and an anterior at second stage if required. There is increasing literature that MIS has fewer surgical complications and better nonneurological outcomes.,, MIS does have its drawbacks in that it cannot be used in all types of spinal fractures, especially in translational injuries, and those with neurological deficits. There is also a limited capability for fracture reduction, and fusion cannot be performed. A systematic review by Javier et al. summarizes the available literature on damage control in spine fracture surgery in polytrauma. They conclude that most papers advocate fracture stabilization within 72 h of the injury which is associated with a lower incidence of complications, hospital stay, ICU stay, and lower mortality. In a polytrauma situation speed is of the essence, and hence, definitive imaging should not be delayed by less accurate investigations. The imaging technique of choice will most often be a head to toe contrast-enhanced multidetector CT. Aggressive resuscitation of the patient was continued, blood products and fluids were transfused as required. The metabolic acidosis corrected significantly (pH-7.30), and the vital parameters began to stabilize. However, the pulmonary condition deteriorated requiring increased O2 demand. It was reasoned that spine fracture stabilization would allow us to improve lung toileting, and hence, taken up for early stabilization (within 24 h from presentation). Positioning of the patient prone was challenging as he had intercostal chest drains bilaterally, and we had to keep the injured limb in extension as it was immobilized in a long leg plaster slab. The options for stabilization were traditional open versus MIS techniques. We chose to do an open procedure, as there was a translational component with facet dislocation that needs to be reduced. In addition, assessment of the CT scan axial sections showed transverse process-pedicle junction fractures at multiple levels, we reasoned that it would be safer to place pedicle screws in the standard open manner. An open reduction and pedicle screw fixation from D1 to D9 were performed [Figure 3]. The long construct was required due to the multiple level transverse process-pedicle junction fractures. After wound debrima, the femur fracture was stabilized with an external fixator. Postoperatively, improved in-bed mobilization helped improve pulmonary care and function. He was shifted out of the ICU after 2 days. Implantable cardioverter-defibrillator was removed on the 5th day, and he was discharged on the 10th postoperative day. At 12 months follow-up, the patient has remained symptom-free since the last evaluation and is ambulatory. Plain X-rays showed fracture healing with no loss of reduction or implant loosening. Pape HC, Giannoudis P, Krettek C. The timing of fracture treatment in polytrauma patients: Relevance of damage control orthopedic surgery. Am J Surg 2002;183:622-9. Schlegel J, Bayley J, Yuan H, Fredricksen B. Timing of surgical decompression and fixation of acute spinal fractures. J Orthop Trauma 1996;10:323-30. Croce MA, Bee TK, Pritchard E, Miller PR, Fabian TC. Does optimal timing for spine fracture fixation exist? Ann Surg 2001;233:851-8. Pakzad H, Roffey DM, Knight H, Dagenais S, Yelle JD, Wai EK, et al. Delay in operative stabilization of spine fractures in multitrauma patients without neurologic injuries: Effects on outcomes. Can J Surg 2011;54:270-6. Bliemel C, Lefering R, Buecking B, Frink M, Struewer J, Krueger A, et al. Early or delayed stabilization in severely injured patients with spinal fractures? Current surgical objectivity according to the Trauma Registry of DGU: Treatment of spine injuries in polytrauma patients. J Trauma Acute Care Surg 2014;76:366-73. McLain RF, Benson DR. Urgent surgical stabilization of spinal fractures in polytrauma patients. Spine (Phila Pa 1976) 1999;24:1646-54. Rüedi TP, Buckley Richard E, Moran CG. AO Principles of Fracture Management. 2nd ed. New York: Thieme; 2007. Dalal SA, Burgess AR, Siegel JH, Young JW, Brumback RJ, Poka A, et al. Pelvic fracture in multiple trauma: Classification by mechanism is key to pattern of organ injury, resuscitative requirements, and outcome. J Trauma 1989;29:981-1000. Vallier HA, Moore TA, Como JJ, Wilczewski PA, Steinmetz MP, Wagner KG, et al. Complications are reduced with a protocol to standardize timing of fixation based on response to resuscitation. J Orthop Surg Res 2015;10:155. Reich MS, Dolenc AJ, Moore TA, Vallier HA. Is early appropriate care of axial and femoral fractures appropriate in multiply-injured elderly trauma patients? J Orthop Surg Res 2016;11:106. Pape HC. 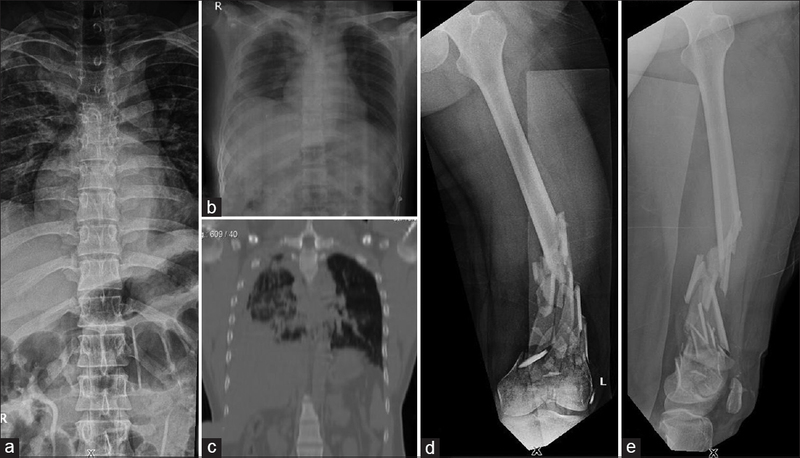 Effects of changing strategies of fracture fixation on immunologic changes and systemic complications after multiple trauma: Damage control orthopedic surgery. J Orthop Res 2008;26:1478-84. Stahel PF, Flierl MA, Moore EE, Smith WR, Beauchamp KM, Dwyer A, et al. Advocating “spine damage control” as a safe and effective treatment modality for unstable thoracolumbar fractures in polytrauma patients: A hypothesis. J Trauma Manag Outcomes 2009;3:6. Scaramuzzo L, Tamburrelli FC, Piervincenzi E, Raggi V, Cicconi S, Proietti L, et al. Percutaneous pedicle screw fixation in polytrauma patients. Eur Spine J 2013;22 Suppl 6:S933-8. Schmidt OI, Strasser S, Kaufmann V, Strasser E, Gahr RH. Role of early minimal-invasive spine fixation in acute thoracic and lumbar spine trauma. Indian J Orthop 2007;41:374-80. Giorgi H, Blondel B, Adetchessi T, Dufour H, Tropiano P, Fuentes S, et al. Early percutaneous fixation of spinal thoracolumbar fractures in polytrauma patients. Orthop Traumatol Surg Res 2014;100:449-54. Chávez JP, Atanasio JM, García EA, Zuno JC, González RT. Damage control in thoracic and lumbar unstable fractures in polytrauma. systematic review. Coluna Columna 2015;14:152-6. Available from: http://dx.doi.org/10.1590/S1808-1851201514020R131.